Whether powered by gas or an electric motor, Golf Carts are primarily a simple conveyance to conveniently transport you and your clubs around the golf course. Some golf courses and golf resorts however, go that extra mile to bring an extra measure of pleasure to your round. Without even getting into the world of customized privately commissioned golf carts, the pleasure of your round can be greatly enhanced by riding for the day in the lap of luxury usually afforded to only those who can afford those customized rides. 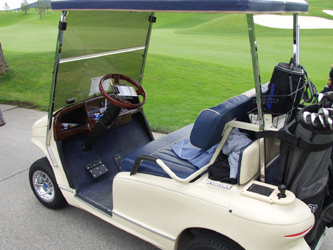 Where did you find the nicest golf carts you've ever had the pleasure of using for a round of golf? For me it was the golf we played at The Coeur d'Alene Golf Resort in Coeur d'Alene Idaho. Not only does the course offer the majestic beauty of playing golf along the shores of the picturesque Lake Coeur d'Alene, but the picture above shows the Cadilac of Public Use Golf Carts. These carts had the standard issue cup holders and storage in the dash, but the features that took it beyond the ordinary were the: burl-wood dash-board and steering wheel; the chrome wheels; the ultra-plush cushioning in the seats; extra storage/cooler space on the right rear fender and under the hood; a club and ball washer on the left rear fender; and tee dispensers built right into the rear roof supports. I've been fortunate enough to have played golf in Hawaii, Scottsdale AZ, Hilton Head SC, Las Vegas NV, and many other notable golf meccas, but never before and never since Coeur d'Alene have I seen such luxury in a public-use golf cart. We have a new page dedicated to Golf Carts" where you can learn more and share the tales of your greatest Golf Cart Experiences. Visit the link above to tell us all where you found the most memorable Golf Carts on your golf travels. "Hit 'em Straight and Not Too Often"